Welcome to Stone Mountain Volkswagen! It’s Not About Us… It’s All About You! Stone Mountain Volkswagen works hard to make sure you always enjoy your experience when you visit us. Whether you need a new Volkswagen or a pre-owned car, our dealership in the greater Atlanta area will offer you a range of options that can fit your unique automotive needs. Stone Mountain Volkswagen is proud to add the Volkswagen Gold Pin to its long list of honors and accolades, one of the most prestigious awards given by Volkswagen. To earn the Gold Pin a dealership must live up to the considerable expectations placed upon them by Volkswagen. Retailers must faithfully represent the Volkswagen brand, attract and provide an outstanding experience to customers which results in total satisfaction and loyalty. The Gold Pin is as desired at is it difficult to obtain as only 10 were awarded this year. Furthermore, the Gold Pin can only be received by a dealership once. Stone Mountain Volkswagen is a permanent member of an exclusive club and can now strive for the even rarer Diamond Pin. The management and staff acknowledge the important role all our customers played in making this happen and we want to thank every one of you. Without the opportunity to serve you this would not have been possible so please accept the sincerest gratitude from everyone here at Stone Mountain Volkswagen. Service means more to us than just showing you our inventory: for us, excellent customer service means knowledgeable advice, pressure-free test drives, helpful financing, and expert repairs, all done with enthusiasm and a smile. So if you’re looking for a new or pre-owned Volkswagen in the Atlanta area, visit us at Stone Mountain Volkswagen. We look forward to helping you today! 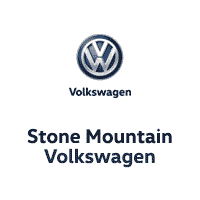 Stone Mountain Volkswagen	33.8446903, -84.053189.